I hadn't heard of Astonish until they contacted me back in September. I was looking for back to school products and they approached me with their large cleaning range. One of my biggest bug bears with the kids being at school, is them coming home with unknown marks all over their white shirts! 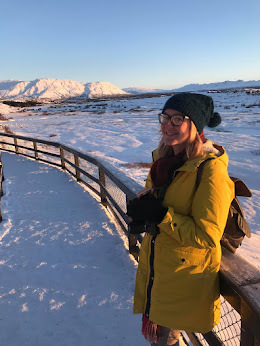 They sent me so many items that it has taken me a while to work my way through trying them all and wanted to be able to tell you what I thought of the whole range. 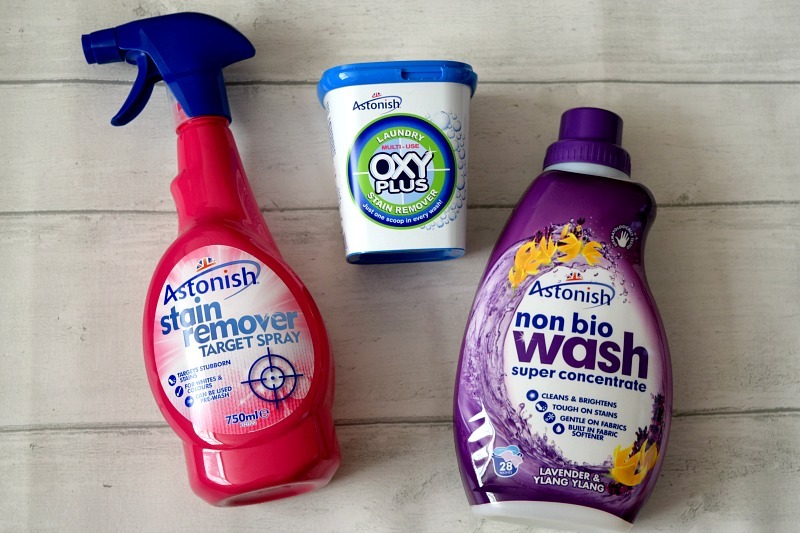 The range includes fabric refresher, mould and mildew remover, stain remover target spray, fabric conditioner, oven and cookware cleaner and oxy plus stain remover. This time of year we get problems with damp around a few of our windows that need tackling quite often. The mould and mildew remover is one of my favourite products. I have used so many over the years which have been ok, but this one is brilliant. As well as giving a better clean than any other I have used. There was no sign of it coming back for much longer than usual and when it did, it was easily removed again. The Oxy Plus stain remover is another great one. I have used a much more expensive version for years but I still often found the kids clothes coming out with stains. Using this in each wash along with the target spray on the offending items, has left me with nice crisp white washing with no staining so far. The two work so well together and save me money on replacement school uniform and buying expensive stain removers. The fabric conditioner is also lovely and leaves washing with a lovely scent and feeling really soft. I love having that clean smell on all of our clothes and bedding when it is washed! I have never really used fabric refresher. I use throws on my sofas which are washed regularly so I hadn't ever considered buying it. The fabric refresher does exactly what it says and does give your furniture a lovely fresh scent. It is nice to be able to spritz a bit on the furniture when expecting guests to make the room feel fresh and it really does smell good. I invested in a nice expensive range cooker last year, what I didn't think about before buying it, was that with being much larger, it gives me a lot more to clean. The Astonish oven and cookware cleaner comes as powder in a pot and to use you follow the instructions on the side of the pot depending on the type of oven or different surface you would like to clean. The instructions are really detailed and even inform you of when to not use that particular product on certain materials. It is so easy to use and is great for getting burnt or greasy areas inside the oven. All the products I received carry a vegan and cruelty free symbol which is great! It is always nice to know that no animals have been harmed in the making of products and it tells a lot about a company, if they decided against testing on animals! 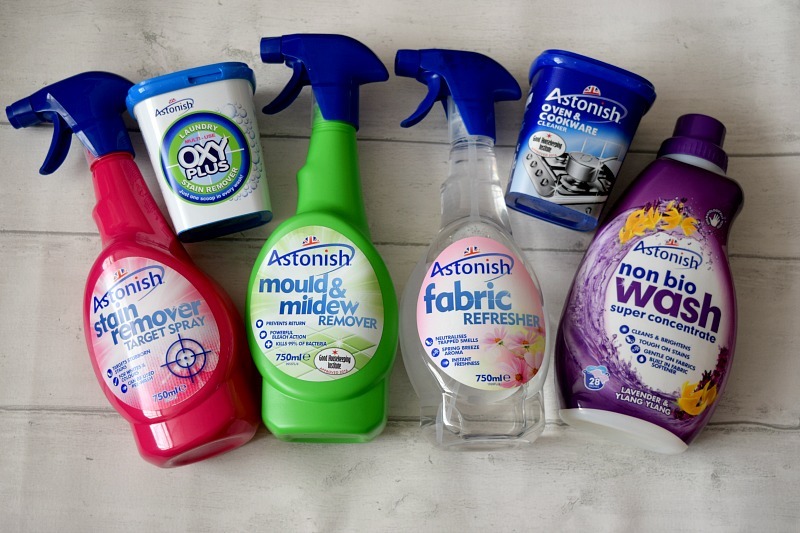 I would definitely buy Astonish products in future and really recommend all of the items I have tried! I received these items free of charge in exchange for an honest review. All opinions are my own.